Spray 13x9-inch (3-quart) glass baking dish with cooking spray. In 2-quart saucepan, mix topping ingredients. Cook over medium heat, stirring constantly, until smooth. DO NOT BOIL. Spread topping in baking dish. In shallow bowl, beat eggs with fork. Beat in milk, vanilla and salt. Dip bread slices into egg mixture, making sure all egg mixture is absorbed; arrange over topping in dish. Cover; refrigerate at least 8 hours or overnight. When ready to bake, heat oven to 400°F. Uncover baking dish; bake 20 to 25 minutes or until bubbly and toast is golden brown. Remove from oven; let stand 3 minutes. Place large heatproof serving platter upside down over baking dish; turn platter and baking dish over. 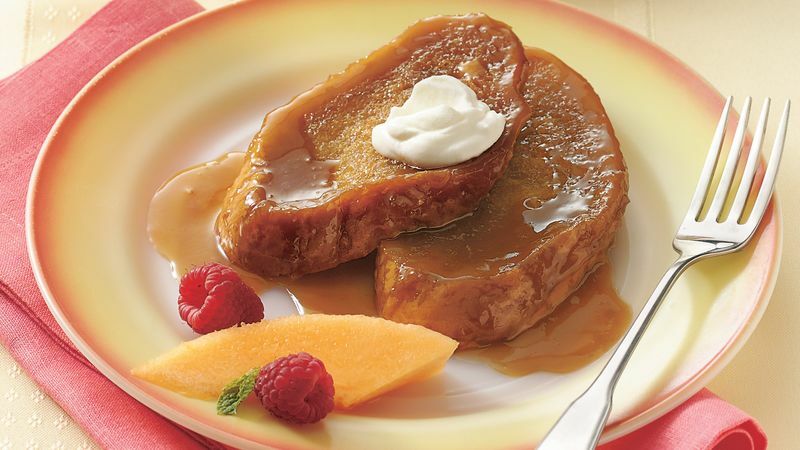 Remove baking dish, scraping any extra caramel topping onto toast. Serve immediately. This recipe is the perfect make-ahead brunch dish. Make it a day ahead, cover it and refrigerate it until baking time.